This pic is a bit dated, but it's close enough. Here's my aquarium Info: 30g/113liter sumpless mixed reef system—zoanthids, corallimorphs, LPS, a few SPS corals, maricultured live rock base; Reef Octopus skimmer; ProdiBio system and other supplements; Kessil A160EW Tuna Blue, A160WE Tuna Sun, A150W Sky Blue. The glass tank is my temporary tank, and everything, including corals and inverts I have added to the system since this was taken, will be moving to a 20g lagoon reef which will be placed on that rather beefy cart and lighting rack on the right. 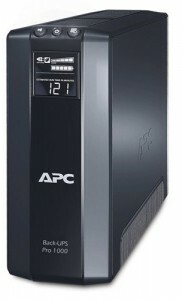 The dimensions of the new system are 20l x 20w x 10h, and will be acrylic. 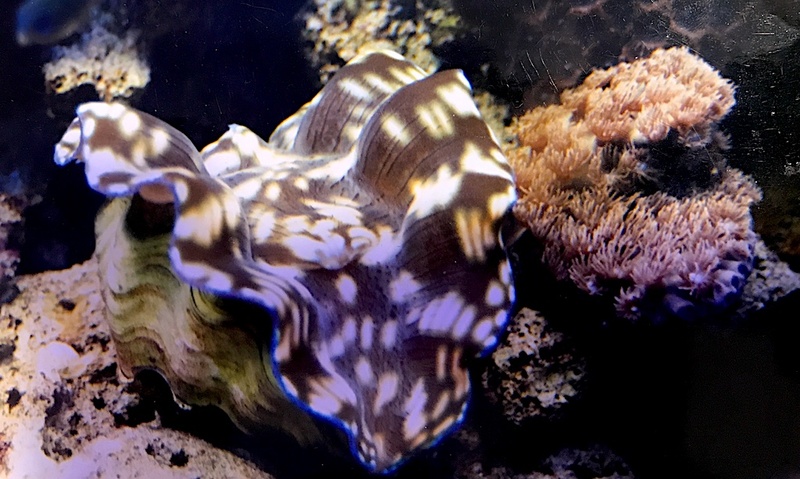 By using a photographic barrier filter I can capture images and manipulate them into something that is very close to what my tank looks like late at night, under the blues and actinic lighting, when the other lights are off—see image below. 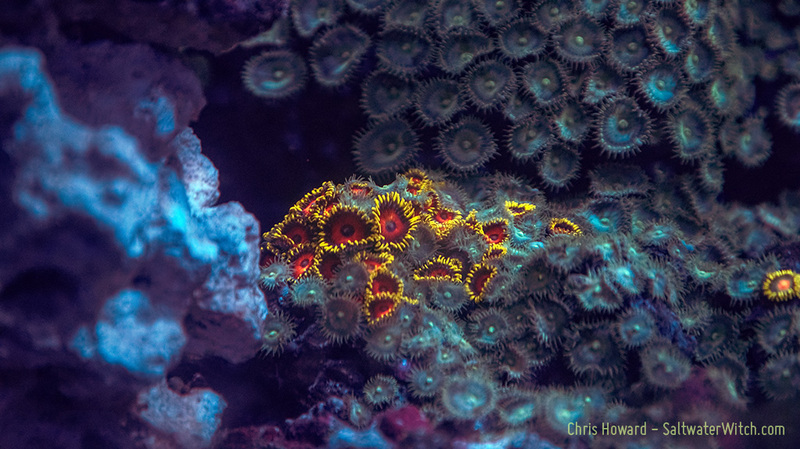 Although it's not necessarily a property of a coral's zooxanthellae (zoa-zanth-elly) and chlorophyll concentrations, many photosynthetic corals (corals that host zooxanthellae) contain fluorescent proteins of various pigments in their tissues--oranges, reds, cyans. 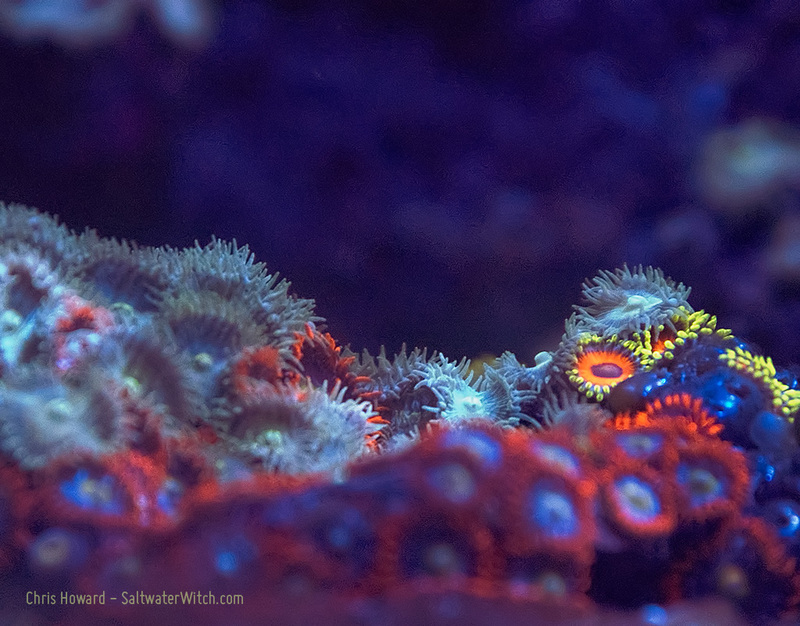 ...what my tank looks like late at night, under the blues and actinic lighting, when the other lights are off. 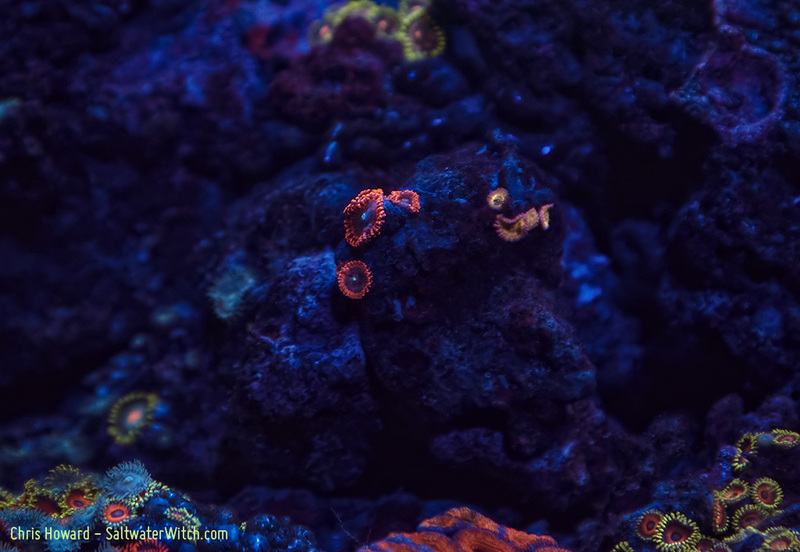 April 5, 2015 - Pics and video of my 10 gallon nano-reef tank using my iPhone and the Olloclip macro lenses. I assembled all of this iMovie, and posted it to Youtube. 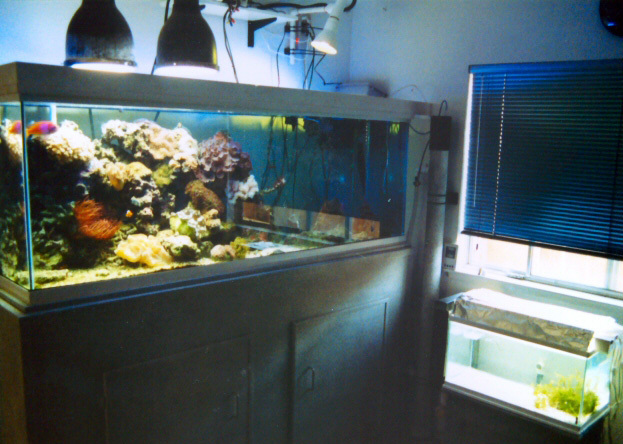 I set up my first marine aquarium with a sea anemone and a damsel fish in the mid-1980s, and my first successful reef aquarium (started in 1989 and ran for about 8 years) was a 160g glass tank with Metal Halides, mixed reef inhabitants (soft and hard corals, mostly Gulf/Florida stock with some Pacific corals, fish, fairly large tridacna clam). This system evolved organically from smaller aquariums into a fairly complex system (for the time), with my original 15g tank acting as what today we would call a refugium (but back then it was a full lighted aquarium that ran off the sump in which I kept a couple kinds of algae, Caulerpa sp., etc). If I could characterize this system with one word it would be “experimentation”, or maybe even “unplanned”. Even so I was very diligent with the maintenance, and after a while, with moderate water changes, it pretty much ran itself. I built several protein skimmers–one was five-feet tall. I was constantly moving stuff around, building filters, playing around with the secondary lighting–actinics, grow bulbs, etc. My primaries were two Coralife metal halide pendant lamps. 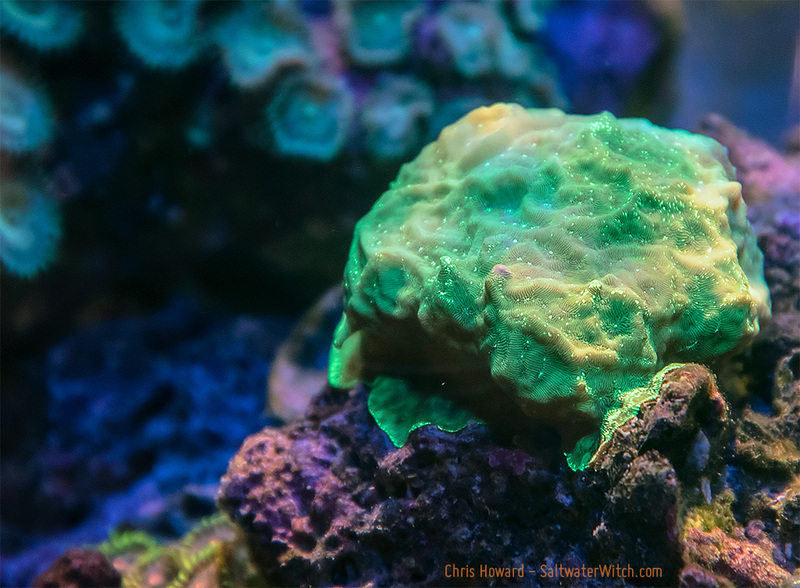 Fast-forward to 2014 through today, and I have started building out a new reef aquarium, this time going with a “nano” or very small aquarium. And this time I’m planning carefully–I mean every step. I also have some pretty strict requirements. 5. Fairly realtime view into the system’s chemistry from anywhere (e.g., web, phone). Here’s my cabinet, a “Luxor Mobile Steel Adjustable Height AV Cart with Storage Cabinet” I bought at Amazon: https://www.amazon.com/gp/product/B002C5QBA4. I upgraded the bolts to something hefty and stainless steel. 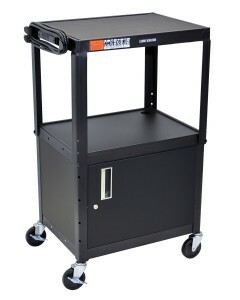 The whole cart is made of 20 gauge steel, and should easily be able to handle a 70+ pound load. I’ve also cut a nice piece of 3/4 inch birch plywood for the top, varnished, sealed, and drilled for power cables to run down into the cabinet below. 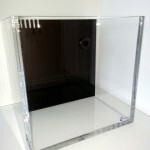 I originally planned for the very small (and cool) 4.3g tank, but I have changed my mind and now I’m going with the Micro-Reefs 7.2 gallon AIO Acrylic Temperate (Rimless design) https://micro-reefs.com/temperate-systems.html (I had toyed with the idea of going with a temperate tank, but I’m back to the tropics–still I love the micro-reefs tanks, and the 1/2 inch acrylic is sturdy as hell). Maintenance: I want the ability to roll the aquarium onto a plastic sheet to do maintenance, water changes, etc. The UPS also gives me the ability to unplug from the wall and roll the whole thing into the kitchen–right up to the sink if I need to. I want to show off some beautiful aquacultured (not taken from natural reef formations) live rock I purchased from Tampa Bay Aquaculture. 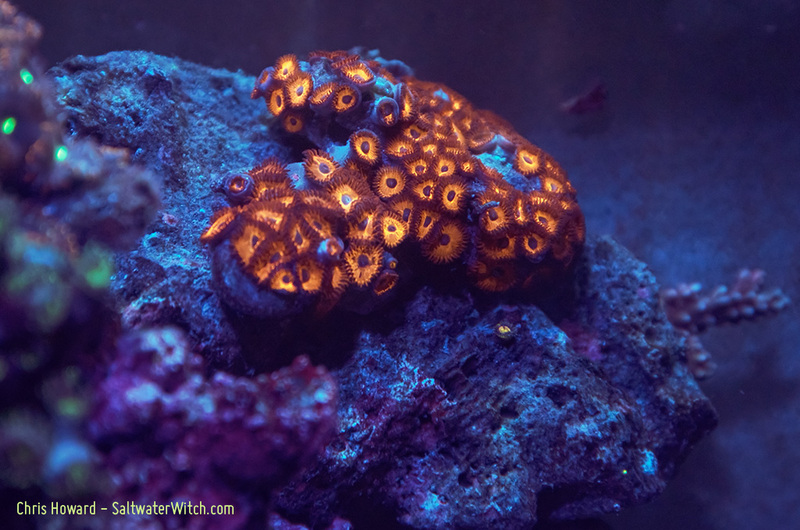 They picked out the perfect pieces for my tank, and sent them via Southwest Airlines cargo to Manchester–air cargo is the only way to go when you’re getting live rock. It’s in the warm Gulf waters one moment (on the farm so to speak) and several hours later it’s in your home. Live = fresh = intact bacteriological system. 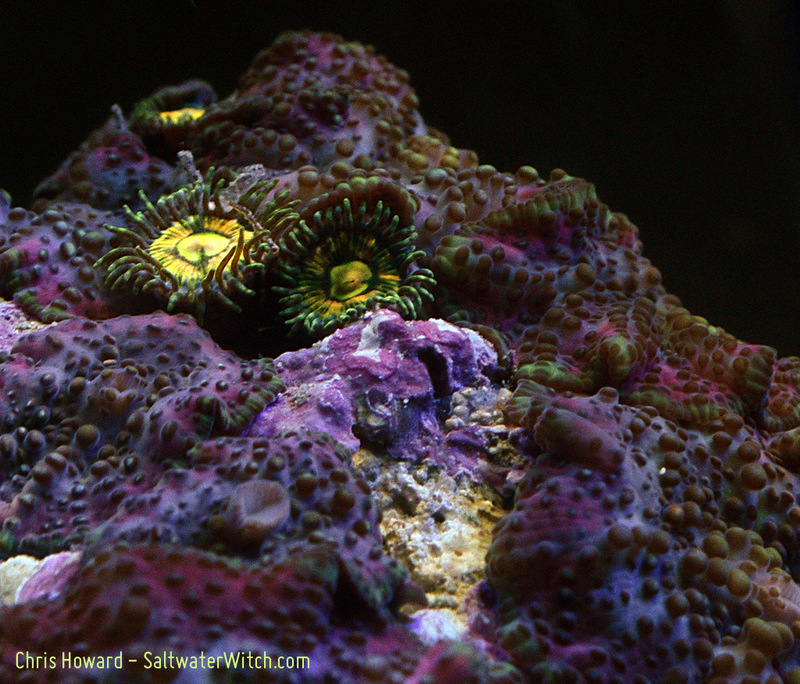 Take a look at the pics–five days after placing the rock in my tank. This rock came with some nice tube coral colonies (Cladocora arbuscula), several different kinds of Ascidean sp. (Sea squirts), and various other clusters of mollusks, sponge, coralline algae. I’ve had a nanoreef tank going for a while–let’s just say a minimalist setup (after being away from the hobby for a decade). Over the last several months I’ve been building out a nice compact (12g total water volume) system for my home office (where I write) and my son’s work space–with everything I want in a reef tank–nice lighting, not too big, self-contained, battery backup for all pumps, skimmer, reactor. It will be a mixed tank–aquacultured coral species from both the Caribbean and Pacific, refugium for macro-algae, sea-plants, and a couple groves of mangrove trees. Except for live sand for the bed, some coralline algae rubble, and six Mangrove trees, everything you see behind the glass came in the big box from Tampa Bay Aquaculture. I’m loving this new tank, and I haven’t even moved in any of my corals yet! 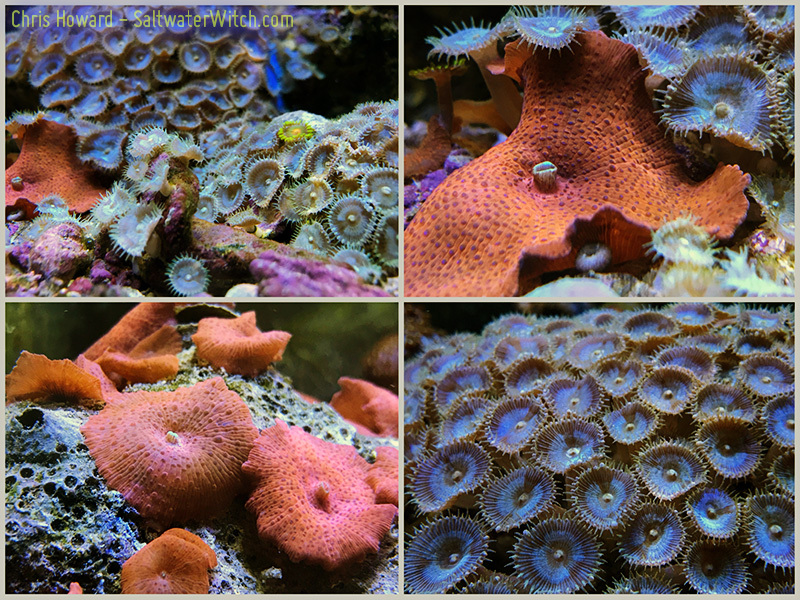 Four more shots of my aquarium, a few different zoanthid species, and the lower-left is a cousin of the Cladocora sp. tube colony I have growing in the tank. Pretty sure this is a Cladocora, but these are larger, squatter, less branching--possibly Cladocora muellerae or debilis. 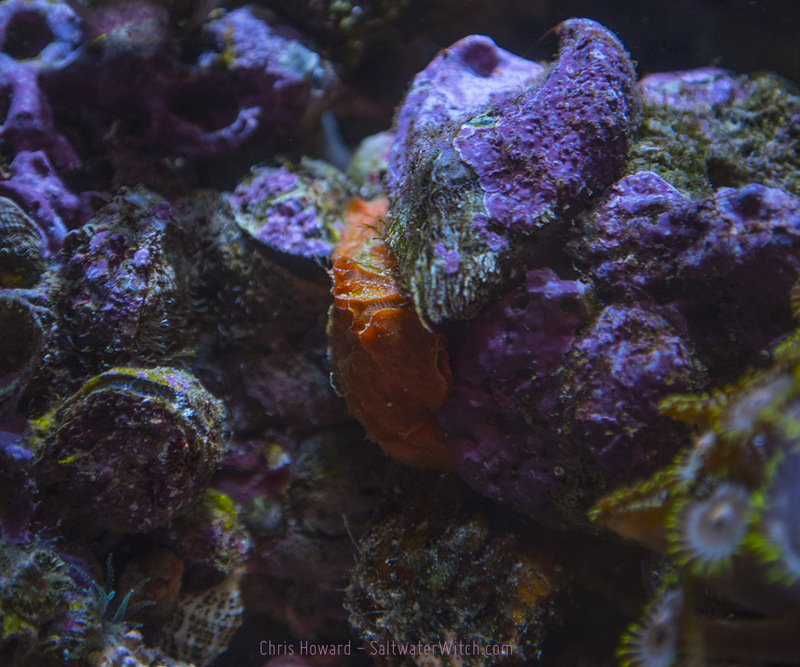 Beautiful orange sponge and a big bivalve covered in coralline algae (the pink and purple stuff)--one of the center-pieces of my tank. 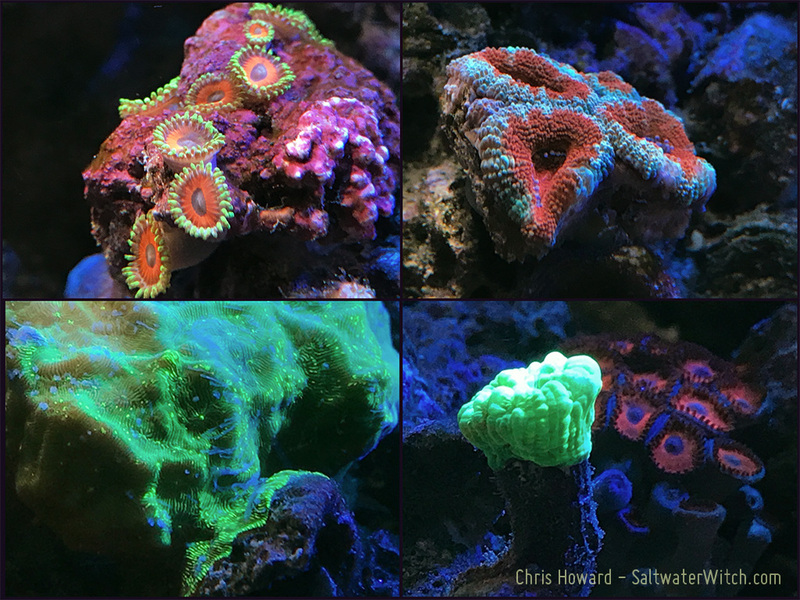 So much of this reefkeeping hobby/obsession is about personal taste, especially when it comes down to how things look in your tank. 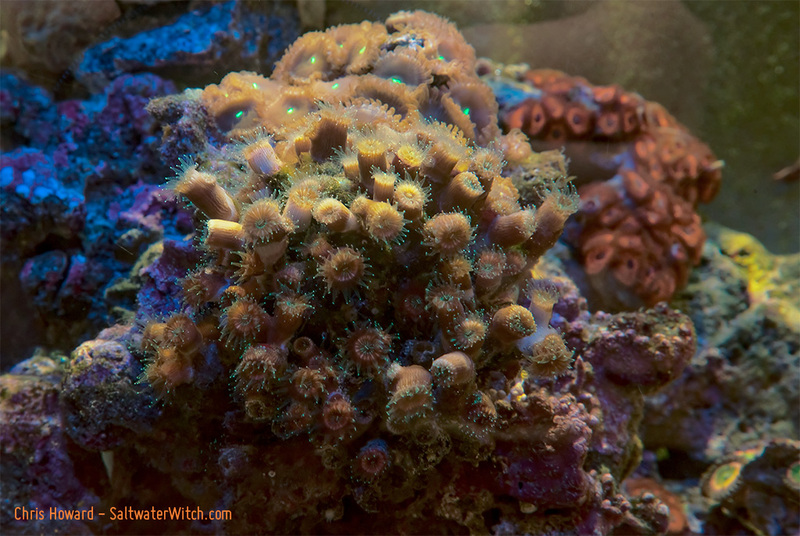 I have pretty strong opinions about what I like to see when starting a reef aquarium: if you ask me live rock is the only way to go--maricultured live rock that's been seeded for years in an ocean somewhere, with encrusting sponge, coralline algae, clusters of mollusks, worms, various coral growths--including a bunch of hitchhikers you may or may not want. (I'll take them, because the alternative doesn't appeal to me at all). 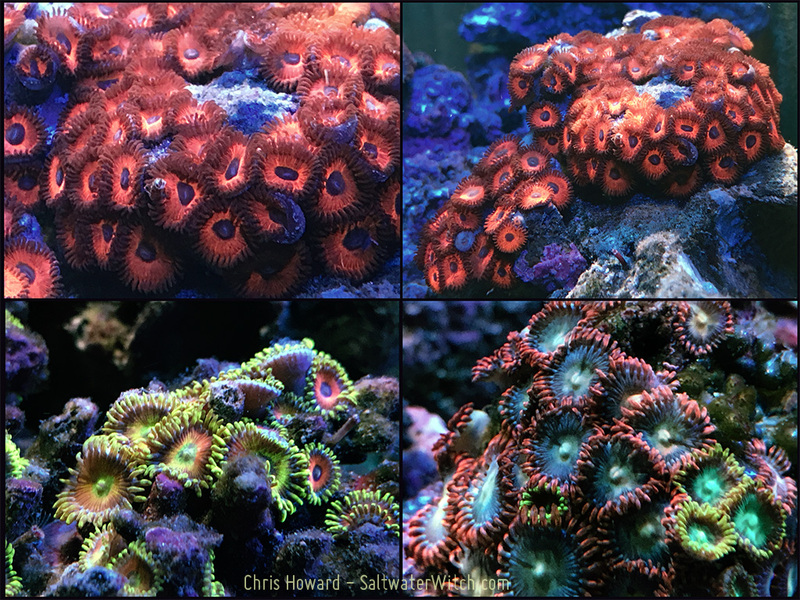 I'm not a fan of sterile rock with frag-plugs of LPS and SPS corals glued here and there. These look unnatural to me. Sure, it may be colorful, and even stunningly beautiful when it all grows out, but there's something missing--a thousand things missing if you count every creature that comes in with live rock. I like a natural looking reef, with invertebrates of all kinds jumbled on the rocks. My favorite tanks on the planet are at the Monterey Bay Aquarium, the lower light tanks, with strawberry corallimorphs (Corynactis californica) covering the rocks, fronds of algae swaying in the currents, and hundreds of creatures of all sizes living, moving, hiding and darting in the shadows. 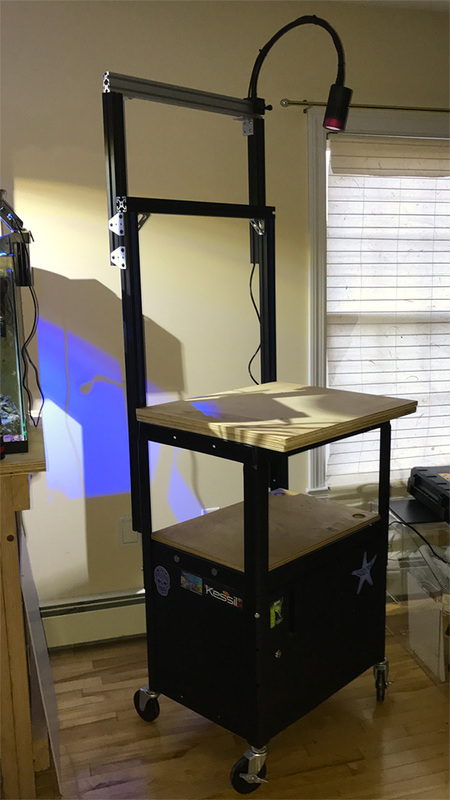 I started this aquarium downsizing and automation project a couple months ago, and it’s going to take at least another four to five months to complete--maybe longer. Even if all the equipment is ready, there’s no hurrying the life behind the glass--you never want to rush the beginning of a new habitat. You have to let it come to life first, let it settle down, find its balance--and that can take anywhere from a couple months to a year. This may actually be the most difficult part of this hobby--the waiting, the patience required to just let things calm down on their own. 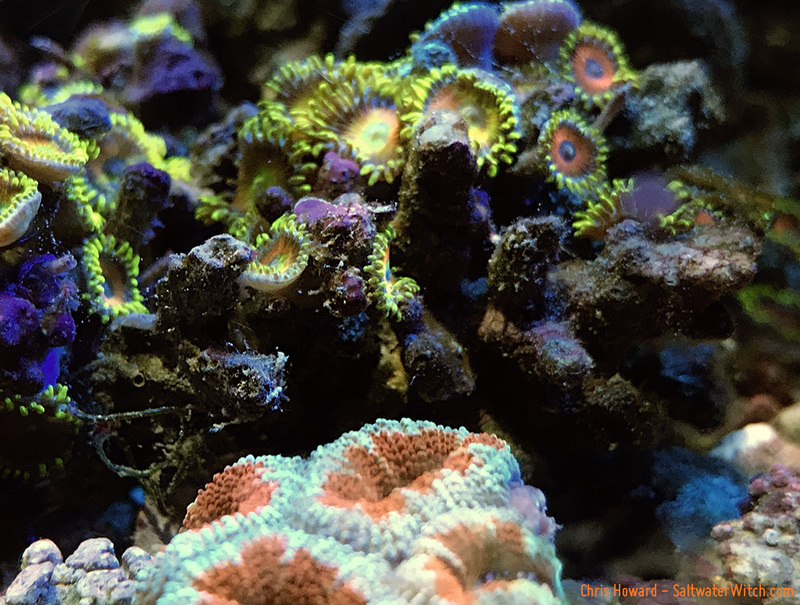 You provide the stability, the nutrients for coral growth and the spread of that beautiful red and purple coralline algae (Lithothamnion sp. and the like). But you can’t rush the process and be successful. You can buy all the frags you want, but it’s going to be hell without a mature system. Okay, back to what I’m working on: You might laugh at the idea of downsizing a 30g/113l tank, which is on the small side in this hobby. 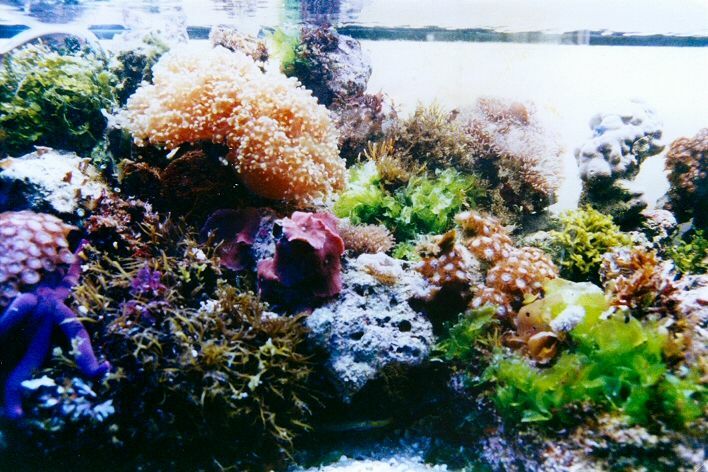 (I consider it a “Nano reef” aquarium, as would many of my fellow aquarists). I have had 40, 60, 160, 200 gallon reef systems in the past, but for the foreseeable future I’m going to stick to a nano-sized system, anywhere from 15 - 20 gallons of total water volume, and I’m starting with the foundation, building out a better, higher-tech moveable base for the aquarium, lighting, dosing system, electronics (battery backup), and the automation infrastructure (timers, temperature control, pH, ORP, monitoring). I have all of this running smoothly right now on the 30g, and transitioning it at some point will be a fairly big task. But back to basics: this weekend I have completed most of what I wanted for the base, the tank stand, with the lighting structure. 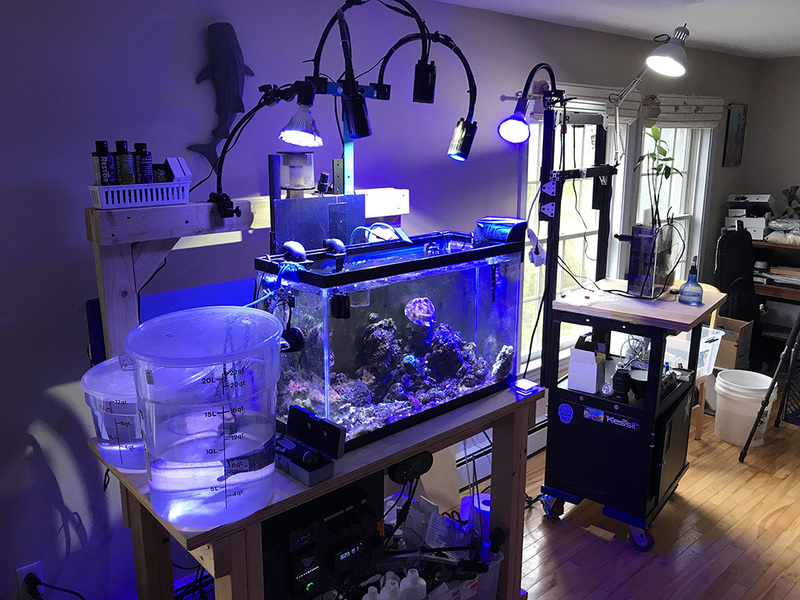 (I run four Kessil LEDs, an A160EW Tuna Blue (all-day blue, color: 20,000K), A160WE Tuna Sun (Daylight, color: 9,000k), A150W Tuna Blue (Mid-day intensity, color: 15,000K), and an H150 Red (2 hours per day at dusk and dawn, wavelength: 620 - 710nm). I know, a lot for light for a smallish aquarium, but they’re not all on at the same time, and they’re on for varying lengths of time. 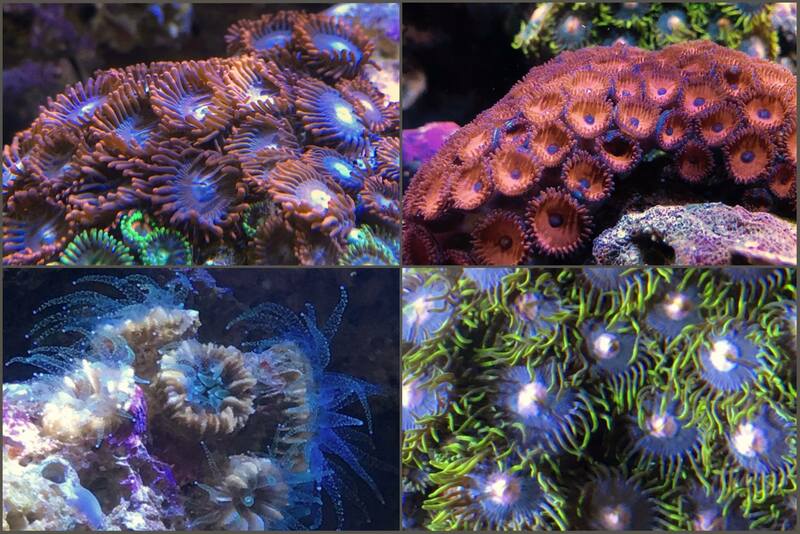 I used my iPhone 7 Plus to take some pics of a group of Zoanthus gigantus in my aquarium (sometimes called "People Eaters" of various colors--purple, red, etc.) These guys are found all over the Pacific--Hawaii, Southern Japan, Southeast Asia. Middle-left is the edge of a good colonial cluster of tube corals (Cladocora arbuscula), and in the background--top right--is an ever-growing disc of montipora sp., possibly Montipora venosa, "sand dollar" montipora. A few more shots of my 30g reef aquarium with the iPhone 7+. 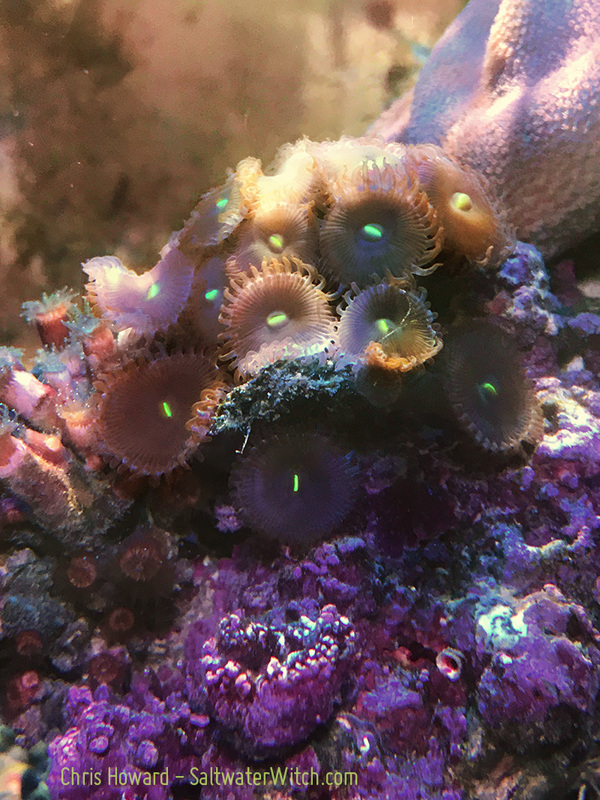 Here's a batch of palythoans (the greenish-blue guys) trying to elbow their way into some rocky space controlled by a couple different varieties of discosoma (the reddish "mushroom" corallimorphs). 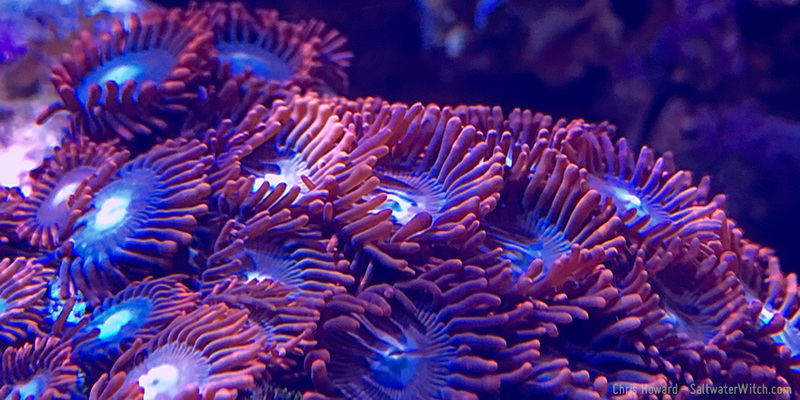 Some reefers use "protopalythoa" to describe some of these, but it's far from certain in which genus to place a lot of these zoa/paly corals—and there's some dispute over "protopalythoa" being a legitimate label for defining the group. Very sad news. Albert Thiel, a legend in the reef aquarium field has died--lost his battle with cancer. 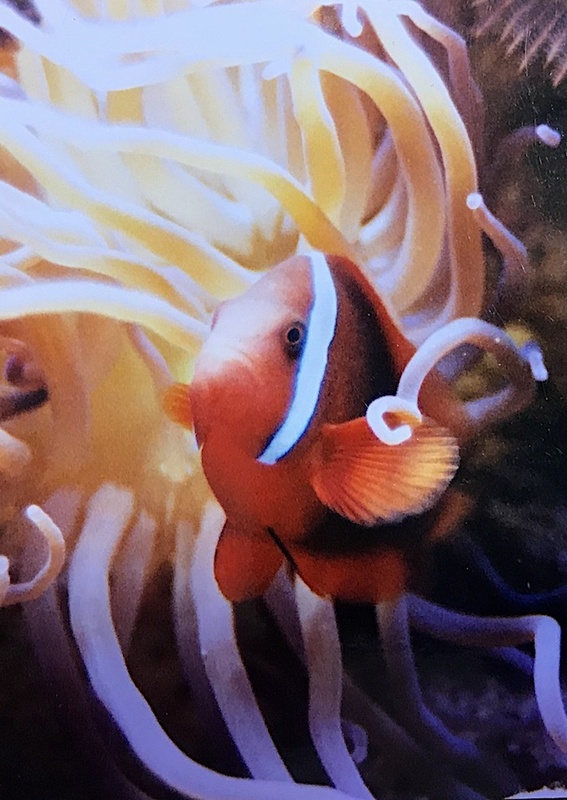 It was 1988 at TropAquarium in San Jose--for me that's where it all began, my first steps into keeping corals and other invertebrates in an aquarium. 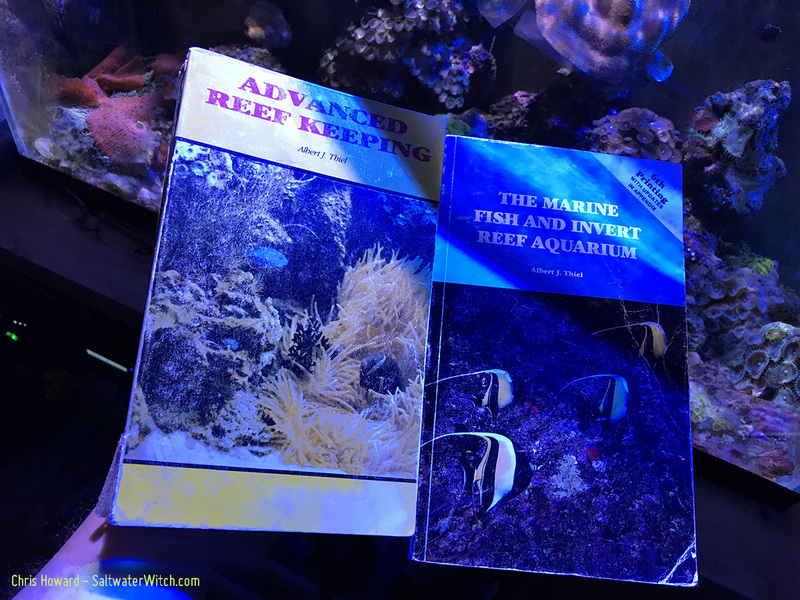 I bought Albert Thiel's book The Marine Fish and Invert Reef Aquarium, and a year later I picked up Advanced Reef Keeping. These two books along with one or two others kept me going for years in this field. I read them cover to cover, over and over, until the covers were swinging loose, ready to fall off. Both of these books are still in my library. So long, Albert Thiel. May 2, 2017 - Some new Rhodactis sp. and Ricordea sp. These are both from Indonesia. I love the irregular, almost brickwork pattern, in the Rhodactis. 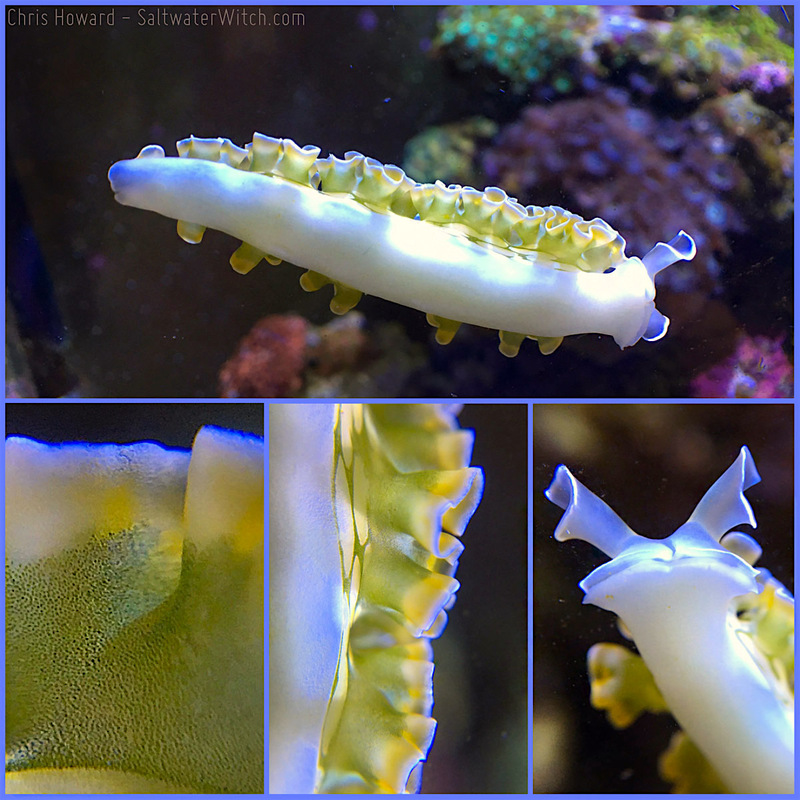 This morph fluoresces with a nice vivid orange. The Ricordea on the other hand is sort of a dull purple, which blends with the color of the rocks under actinic/20,000K lighting. With the daylight and 10 - 15,000K lights, these guys are a range of reddish violets to deep purple. 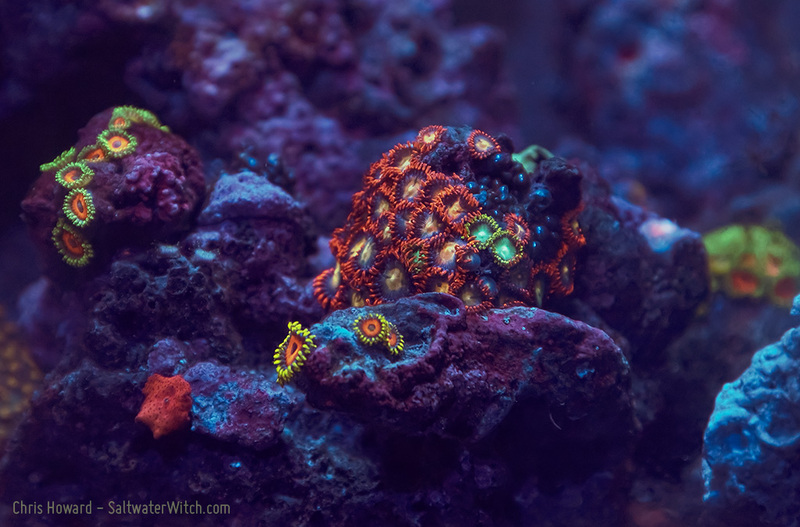 May 4, 2017 - Acropora sp., Zoanthus sp., and Acanthastrea sp. A few shots of the tank, taken with the iPhone 7 Plus and Yellow No 8 filter. May 5, 2017 - Rhodactis sp. 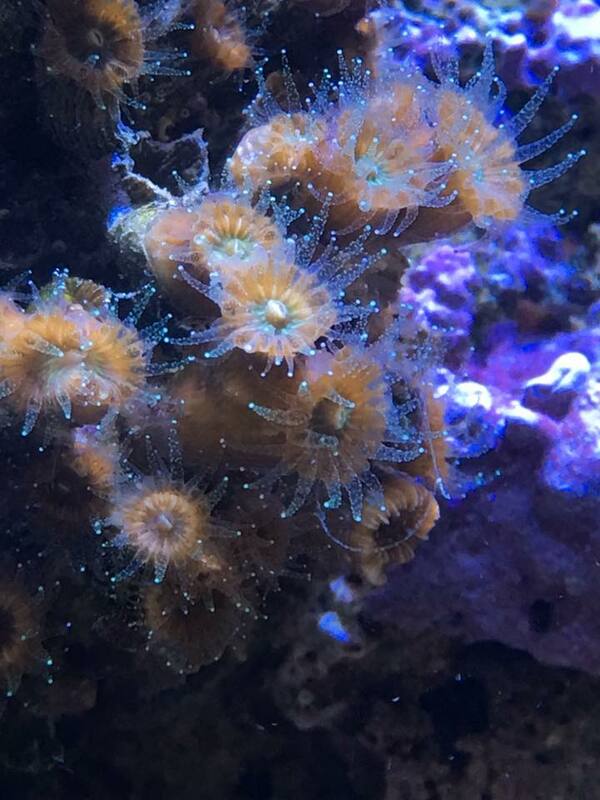 Another shot of my beautiful Rhodactis sp. 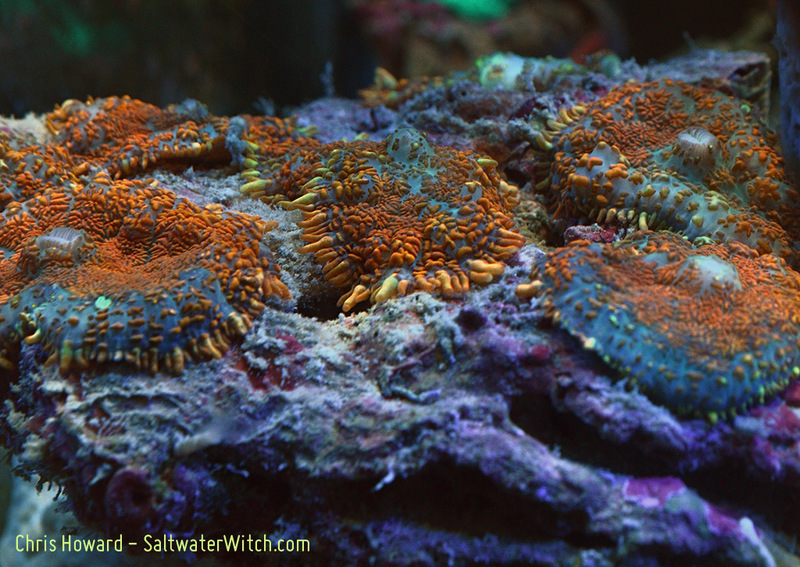 corallimorphs. 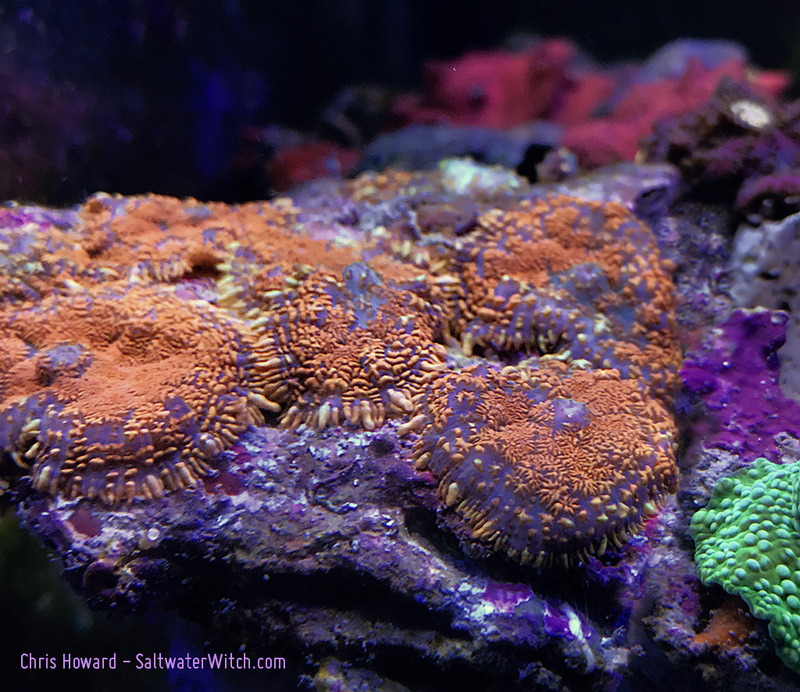 (Camera: iPhone 7 Plus and Yellow No 8 filter; 30g/113l mixed reef, but heavy corallimorphs, zoanthids, and palythoans). May 5, 2017 - Worms, Roxanne! I have a good "crop" of worms going on one rock in the tank, clusters of tiny white-ish tubes sticking up all over. Each of these tubes has two thread-like tentacles or filaments that it uses to pull in food. These could be chaetopterid (Family Chaetopteridae) or spionid worms. Possibly Phyllochaetopterus sp. (False Spaghetti Worm), which also have two thread-like filaments that it uses to pull in food. Phyllochaetopterus sp. worms usually grow much larger than these guys, which are no more than 5 - 8mm, while common species of Phyllochaetopterus grow to as much 5cm long. It could also be these are larval stages of one of these. Or some completely different species of worm. They don't seem to be bothering anyone yet. Going to keep an eye on them, but not too worried since many of these kinds of animals are only here for the detritus, the phytoplankton, or the copepods. Micromussa lordhowensis is a stony coral in the family Lobophylliidae. 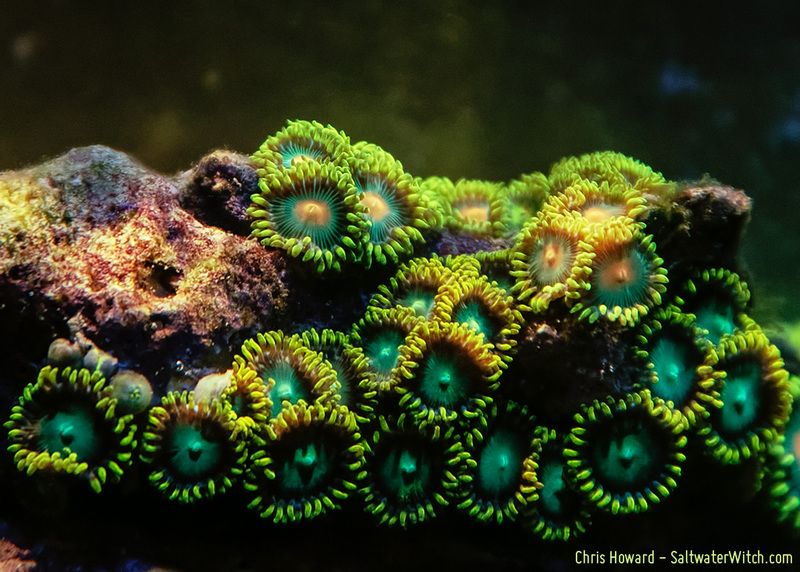 They're often called "Acan Lords" because they used fall under the Acanthastrea genus, and now that marine biologists have moved them into the Micromussa genus, you sometimes see them called "Micro Lords"--Lord is from the species name, lordhowensis, which refers to their original sourcing, Lord Howe island. 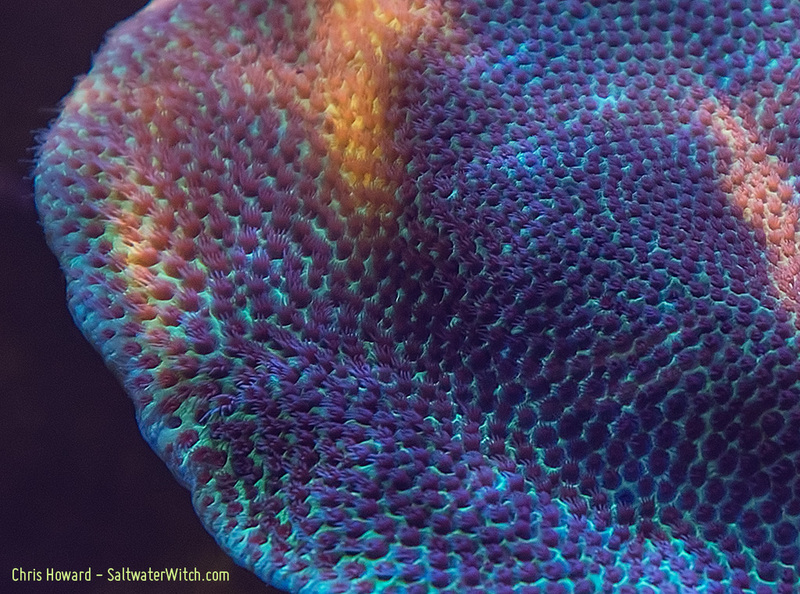 Like almost all of the corals in my aquarium it is a zooxanthellate, which means it hosts zooxanthellae (zo-ozanth-elly), the colorful, photosynthetic symbiotic dinoflagellates that live in the soft tissues of the coral. 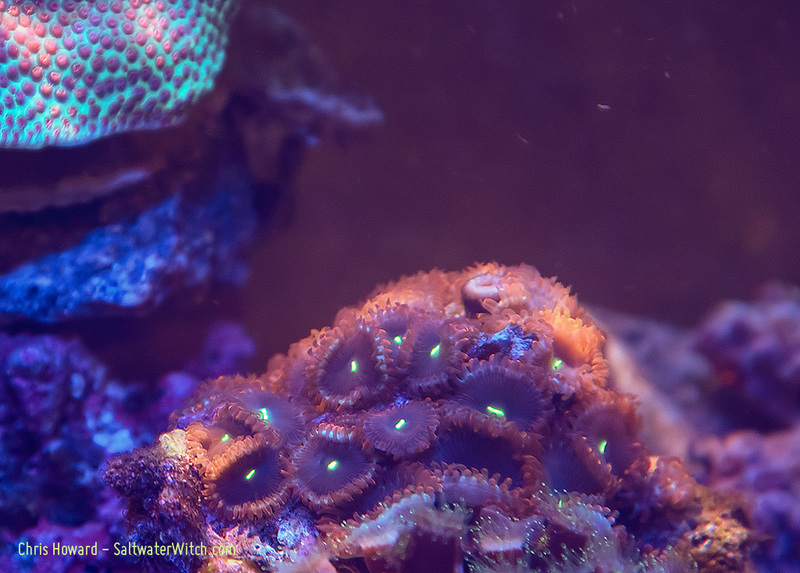 It's the zooxanthellae that produce so much of the energy needs for these animals--essentially feeding on the strong lighting over the tank, but many, like these Micromussas still need to be fed mixtures of phyto- and zooplankton, as well as other meaty foods. And these guys are greedy. I just gave these an initial dusting of food, and they went into hungry mode, sticking out their tentacles, trying to grab anything coming by in the water column. 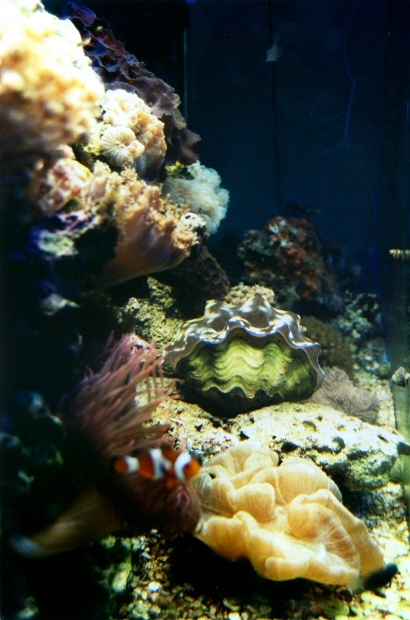 One of several tube coral colonies I have in the tank. These guys are most certainly Cladocora arbuscula. These guys aren't as flashy as many of the zoanthids or the micromussas/acans, but they're still some of my favorites, mainly because I've watched them grow over the years, and they came in the with original batch of Caribbean aquacultured live rock I used to seed the tank. 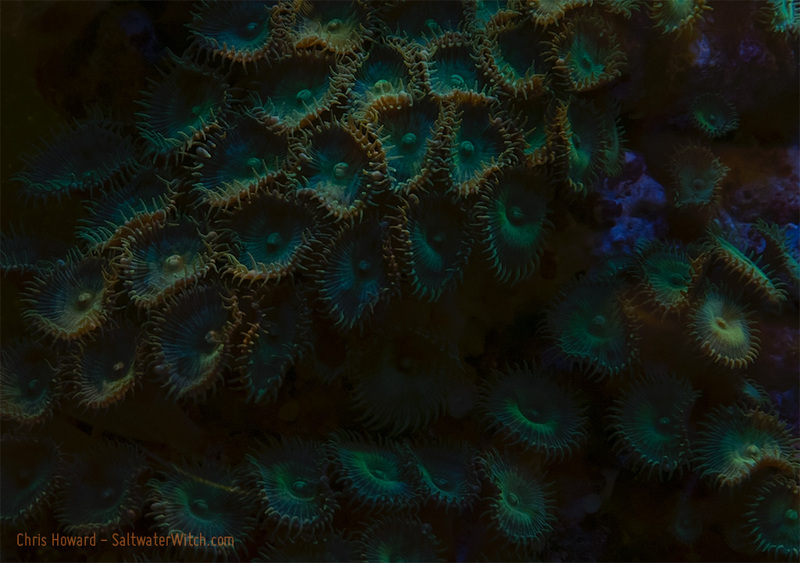 A mix of different corals in the tank, a scattering of zoanthids (upper left), with acans/micromussa on the right. The leptoseris (bottom left) is doing beautifully, oozing over the rocks, and bottom right is one stalk of two from a little Caulastrea sp. 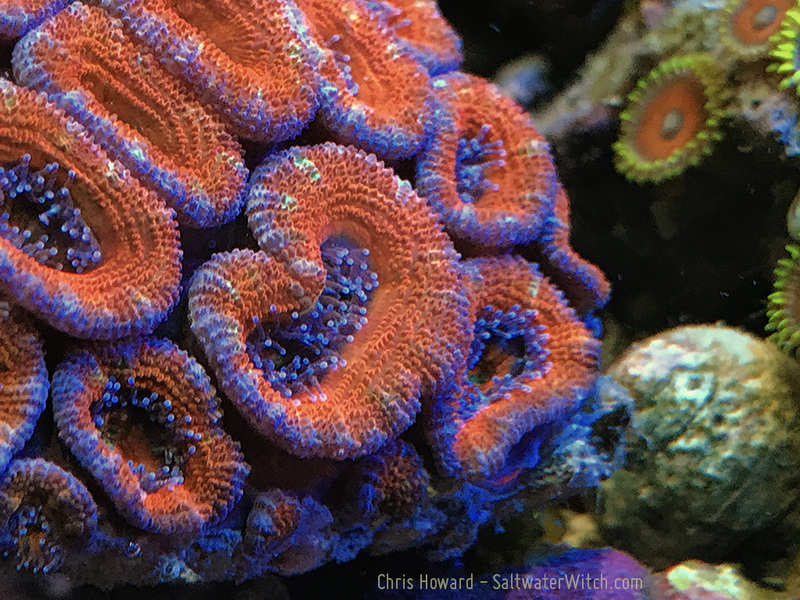 or "Candy Cane coral" frag I got recently. 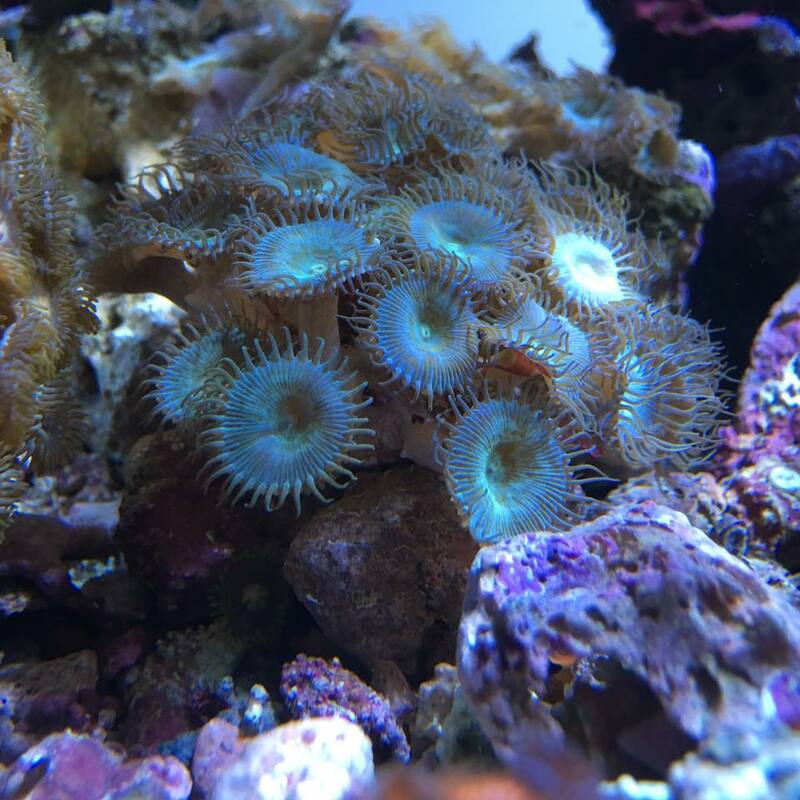 Shots of some of the zoanthids in my tank. I love these red guys with the dark blue-black centers. 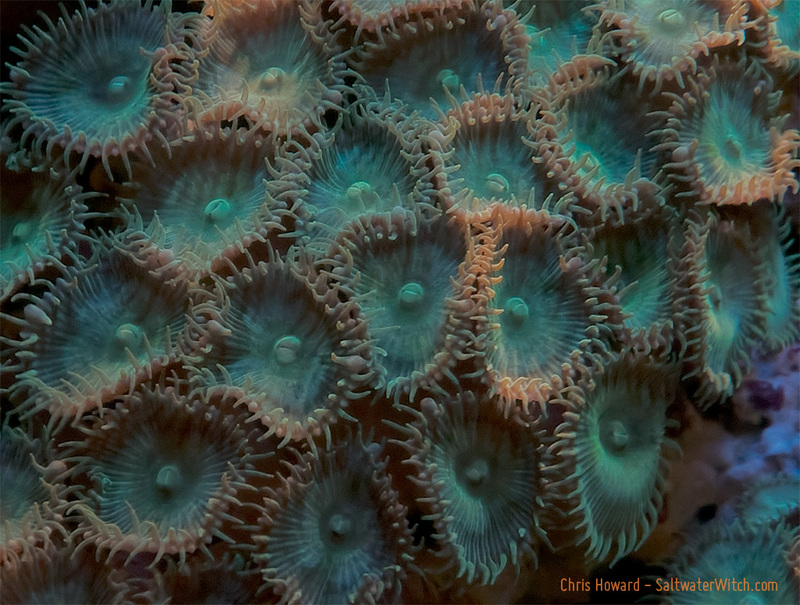 In the trade, it's normal to come up with fanciful names for most corals, like Fruit Loops and Purple People Eaters. I always want to call these reds "deadpool zoas" because of the similarity with his mask. A cluster of Palythoa sp. in my aquarium. I have watched and carefully maintained an environment for corals and other invertebrates—for years, but I don't think I'll ever get used to, or get tired of how beautiful these animals can be. Sure, they're fairly primitive, but they are animals. And they've been around for a while. The first corals appear in the fossil record more than half a billion years ago, in the Cambrian period, and the ancestors of these guys left imprints in calcareous shales and sedimentary rock. (Nikon D750, 85mm, Yellow No 8 Filter).